Today Antutu reveals our list of the global top 10 best performing Android phones for January 2019. What are the best Android phones on the mobile market right now? Check out our most updated January ranking as measured by the average Antutu score. 2. Period of data collection: January 1, 2019 to January 31, 2019. In January, the top three positions are dominated by Huawei smartphones powered by Kirin 980 SoC once again (though in slightly different order). 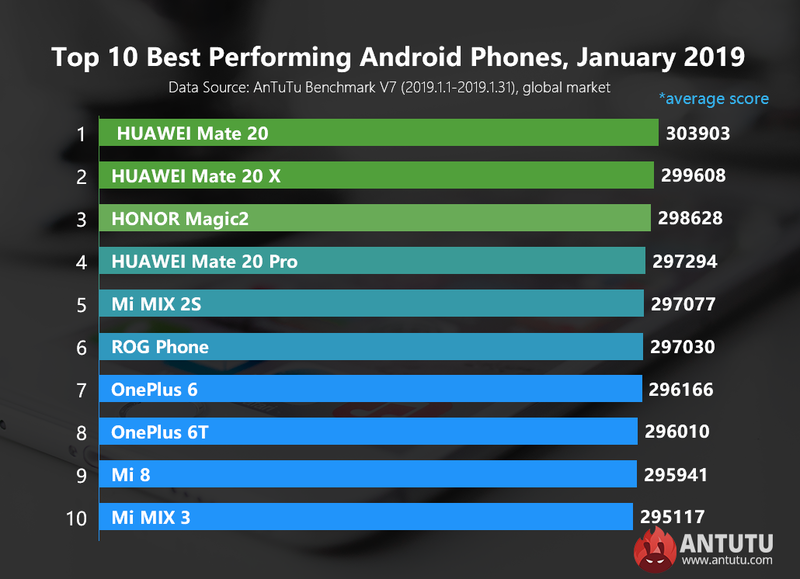 Leading the pack is HUAWEI Mate 20 with an average Antutu score of 303,903, followed by HUAWEI Mate 20X with an average Antutu score of 299,608. HONOR Magic 2 made it to the list for the first time ranking third with an average Antutu score of 298,628. HUAWEI Mate 20 Pro fell to fourth place with an average Antutu score of 297,294. We analyzed the scores in Antutu database and found that for the above four Huawei models there were many scores derived from smartphones that didn’t turn on performance mode, which to some extent led to lower average score. Rounding out the Top 10 are, in order, Mi MIX 2S (No.5, 297,077), ROG Phone (No.6, 297,030), OnePlus 6 (No.7, 296,166) OnePlus 6T (No.8, 296,010), Mi 8 (No.9, 295,941) and Mi Mix 3 (No 10, 295,117). All these smartphones are powered by Snapdragon 845 SoC, and run on Android 9 system, with Qualcomm’s latest GPU driver which allows them to perform better than regular Snapdragon 845 powered smartphones in terms of GPU performance and in turn have higher overall scores. The above data reflects the changes of Android phone performance for January 2019. For more information about the ranking list, please visit Antutu official website or download AnTuTu Benchmark and check in the menu of “Ranking”.